Estimate a car’s real worth by peeking into the past using a free vehicle history report. Enter any Idaho license plate number on the Idaho Free License Plate Lookup to get one. The Idaho Transportation Department serves as another good source of vehicle information in the state. You may inquire by contacting (208) 334-8000, or by visiting the General Information Request page. New residents have 90 days to apply for registration and titling of their cars. In addition to the VIN inspection that must be done, the following documents should be submitted to complete the application: (1) current vehicle title, (2) current vehicle registration, (3) and the applicant’s personal identification. Prepare the payment for fees and associated charges. The Idaho Transportation Department provides the license plates for Idaho drivers. As standard, an Idaho plate usually bears four numbers and three letters. The state requires each plate on the back and front, so that cars can easily be identified on both sides. 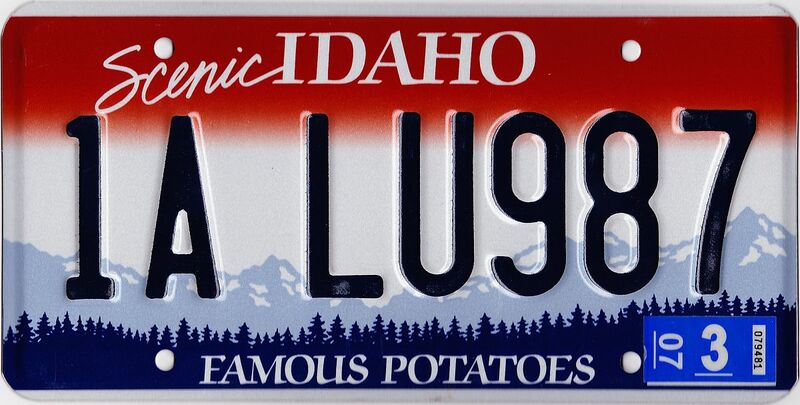 If you have concerns about plates, you may reach out to the nearest Idaho DMV office using Idaho DMV page. Follow the instructions on the form to process your application. Call (208) 334-8649 for more information about special license plates. For most situations, the license plate of a car can be transferred to another vehicle upon request. The process of transferring a license plate in Idaho is further detailed in Idaho DMV Top 10 Tips to Avoid Trouble page. The owner must first register the vehicle before applying for a title. After establishing residency or becoming an owner, the applicant is given a maximum of 90 days to get a title. A dedicated staff will handle the paperwork associated with titling if you have bought your car from a dealer, while you’ll have to work on your own if it came from a private sale. If the title being handled is not named under the applicant’s name, the owner’s written consent and signature must be presented to accept the title request. A bill of sale may be presented as supporting document. The current mileage may need to be shown for vehicles with less than 10 years of age, especially if they weigh about sixteen thousand pounds. The DMV may ask for additional details if a car has a lien, such as the lienholder’s name and address. In case the required out-of-state title is missing or damaged, a duplicate title may be requested from the state where it was issued. If you were submitting your title application via mail, don’t forget to include the Power of Attorney. This document allows an authorized agent of the DMV office to process the title request on behalf of the applicant. To ensure the smooth process of your request, include a satisfying description of the car, along with your signature and/or the owner’s. Buying a used car in Idaho? Don’t make a costly mistake. Run a Free License Plate Lookup for your Idaho-registered vehicle! Run a Free Idaho License Plate Lookup to uncover the full-story of your Idaho-registered vehicle.